Background & Objective: Since its initial discovery, current understanding on the functional role of the Receptor for Advanced Glycation End-products (RAGE) in physiology and in pathology has impressively grown, especially in consideration of its large ligand repertoire (AGEs, HMGB-1, β amyloid, S100B/S100A12) and its potential involvement in the pathophysiology of several chronic human disorders. Downstream RAGE engagement by its ligands, NF-κB signaling activation has been demonstrated in several cell phenotypes, including neurons and glia. 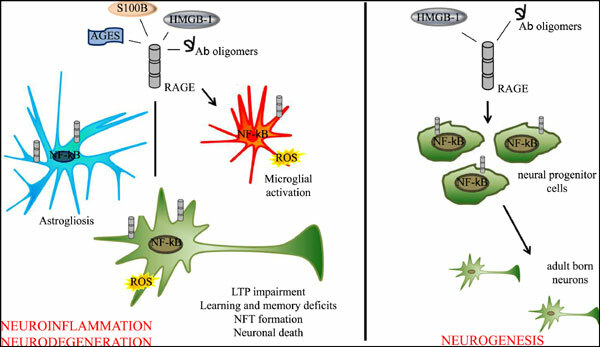 Based on the observation that in Alzheimer's Disease (AD) brain expression of RAGE and its ligands is upregulated and that RAGE/NF-κB axis activation can trigger an autoregulatory loop which further amplifies neuroinflammation and neurodegeneration, this signaling pathway has been hypothesized to greatly contribute to AD pathophysiology. Herein we review the vast array of information supporting a detrimental role of RAGE/NF-κB axis activation in AD brain and discuss those data in the context of recent findings obtained in our laboratory pointing to an unexpected effect elicited by this signaling pathway which may rather contribute to reparative mechanisms in AD, namely positive modulation of adult neurogenesis. Interestingly, the proneurogenic effect resulting from RAGE/NF-κB axis activation could be induced by molecules which are commonly considered as mediators of toxicity, like Aβ oligomers and HMGB-1. Conclusion: Altogether, despite a large set of data suggesting that RAGE may represent an interesting target for the pharmacological treatment of AD, the complex functional roles of the receptor would require the use of molecules able to counteract RAGE negative effects without altering the positive ones such as the promotion of adult neurogenesis. Alzheimer's disease, NF-κB, RAGE, HMGB-1, Aβ, oligomers, neurogenesis, neuroinflammation.